You can go through some of the rest on your own, but it was quite a cast of characters, and while there were one or two pardons that raised eyebrows in the past (Ford's Nixon pardon comes to mind), no one does questionable choices like the Clintons. 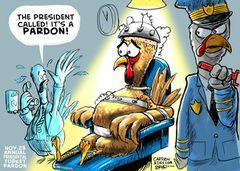 Thanks to the Clinton standards of justice, it means that Republicans can pardon virtually anyone and just use the goose-grander coefficient. The nation standards were lowered, like everything the Clinton's did... and the Clinton apologists just don't care. Carlos Vignali for cocaine trafficking, Almon Glenn Braswell for mail fraud and perjury convictions after they each paid $200,000 to Hillary Clinton's brother (Hugh Rodham) to make their case to Bill/Hillary for them. He was forced to give the money back, after the public was made aware of the payola.